Do you think that you can handle the shin now? We’re going to focus now on the model’s right shin. We are ready to put a bone in the shin now. This will be as simple as the thigh was. You can use the same means that you have learned so far to assign the shin CPs to the bone that we’ll create for it. 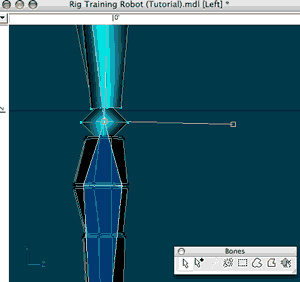 This shin bone will be a child of “(GEO) Right Thigh”, go ahead and select “(GEO) Right Thigh” so that it is flashing. 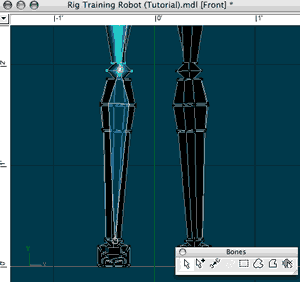 Now create the new bone starting from the tip of “(GEO) Right Thigh” and end it somewhere near the robot’s heel. Remember to point the new bone’s roll handle forward as we did with the thigh. Here the placement for the shin looks good. Let’s check it from the Left view to make sure it bone is properly aligned. I have placed my shin bone here in the front view and it looks fine from this view but I’m going to check it from the [Left] side view to see what adjustments I need to make. I can see that I will need to adjust the bone some in the side view to get the bone centered with the robot’s shin. Your hierarchy should look like this at this point. When I say “attach” the bone, what I mean is that I want to physically join the ends of two bones. A bone can only be attached to its parent (if the bone has a parent). Only one child bone can be attached to a parent bone so if a parent bone has more than one child then only one of them can be attached. When attached, the base of the child bone is joined to the tip of the parent bone. 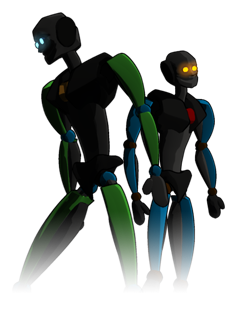 We can see here that the bone should be adjusted some to be centered with the robot’s shin. The way that you can join this new bone to “(GEO) Right Thigh” is by making the new bone active. When you do that then you will see this icon in your Bones toolbar become selectable. This is the Attach Bone tool. Many times you will find that A:M will automatically attach a bone to its parent when you start the bone directly on the parent bone’s tip. You can easily determine if this has been done by checking which options are selectable in the Bones toolbar. If you see that the Detach Bone button is selectable then it means that your bone has been attached to its parent. If you do not want it attached then you can click the Detach Bone button. We’ve attached the shin bone to the thigh. Now that the bone is attached, the Detach Bone button is now selectable. Let’s get ready to join “(GEO) Right Shin” to “(GEO) Right Thigh”. Make sure that “(GEO) Right Shin” is the selected bone and then press the Attach Bone button on your Bones toolbar. Now you’ll see that the base of the shin bone is attached to the tip of the thigh bone. 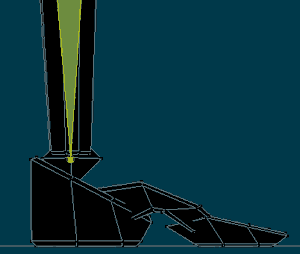 The tip of the shin bone is now centered here in the ankle area. We still need to position the tip of the shin bone. I’m going to center it in the ankle area. 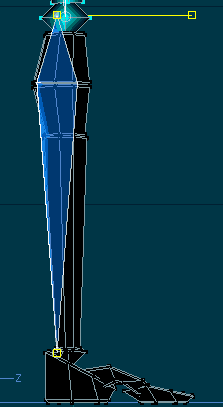 Now we need to unlock the mesh that we locked earlier so that we can assign the shin’s CPs to the shin bone. Switch back to modeling mode. You’ll see that the Lock CPs button is still pressed in the Modeling toolbar. Press the button again to release the lock. Locate and select the right shin group in the “Groups” folder and then lock the rest of the mesh like before. Go back into Bones Mode and assign the CPs to the mesh. Here the shin CP assignment is completed. Examine the mesh from different viewpoints to make sure that you got the whole shin. Now the shin is finished. Next, we are going to do the foot and toe at the same time.